board games | The High Life Suite | Fashion. Food. Love. The High Life Suite | Fashion. Food. Love. It’s Wedding Wednesday! One of my favorite days at The High Life. Today I share a way to personalize a wedding and make it unique by using the game Scrabble. Incorporating Scrabble pieces adds fun, it adds flair and it can help tell your story. Do you and your fiancee love playing Scrabble together? Are you always the winner (or loser) in Words with Friends? Was Scrabble used in the proposal? These are just a few reasons why incorporating Scrabble pieces into your wedding may be ideal for you. It can help tell your story because it’s apart of your story. Below are some ways to use Scrabble in your wedding. Because Scrabble is a game, it adds an element of fun. 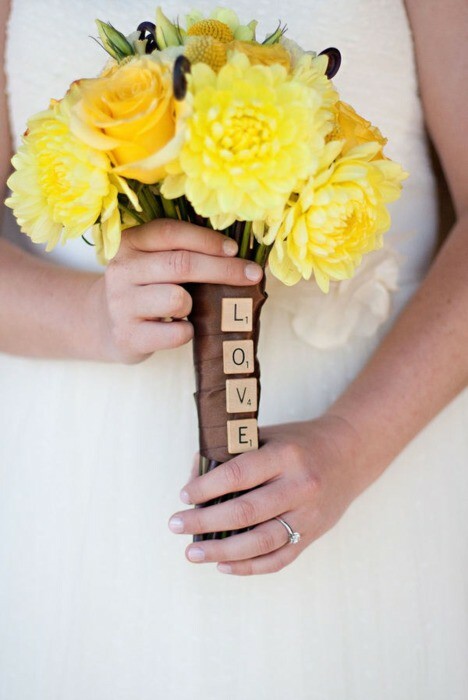 As well, using the pieces to spell out words such as love, forever, always, husband, wife adds a touch of romance. And it also makes for great pictures. Looking to buy Scrabble pieces? Click here for Hasbro’s order form. I love the idea of incorporating Scrabble pieces into a wedding. Perhaps it’s because I enjoy playing Scrabble, but it does help to set the atmosphere for a wedding reception. Whether it be rustic, laid-back or full of fun, Scrabble can help you tell your wedding story.